For this work, I was interested in the relationship we, as students and artists, have to the education surrounding painting, and the act of painting. The final piece is a photograph of a projected photograph of an original painting. It is addressing our relationship to paintings becoming more of a relationship to images of paintings (through textbooks and the electronic presentation in art history classes). How ultimately, paintings are no longer paintings but merely images as evidence of paintings, and have the possibility to be recreated in many different forms. More often than not, the first (and many times the only) experience we have of a painting is usually from an image of the painting, electronically, or from a book. We can be aware of all of the conventions, interesting facts, historical details of a painting without even experiencing it in its original form, in a gallery situation. Our relationship to the creation of paintings has also changed dramatically with the continuous advancements in technology. How media has interfered and changed our understanding as well as creation of paintings. In attempt to explore these two issues I have created a painting which has been pushed to be as far removed from painting as possible. Vermeer’s painting, “Girl with a Pearl Earring” was selected specifically for two reasons. First, because it is an extremely well known art historical painting, so viewers understand more about this painting than just whom it was created by. 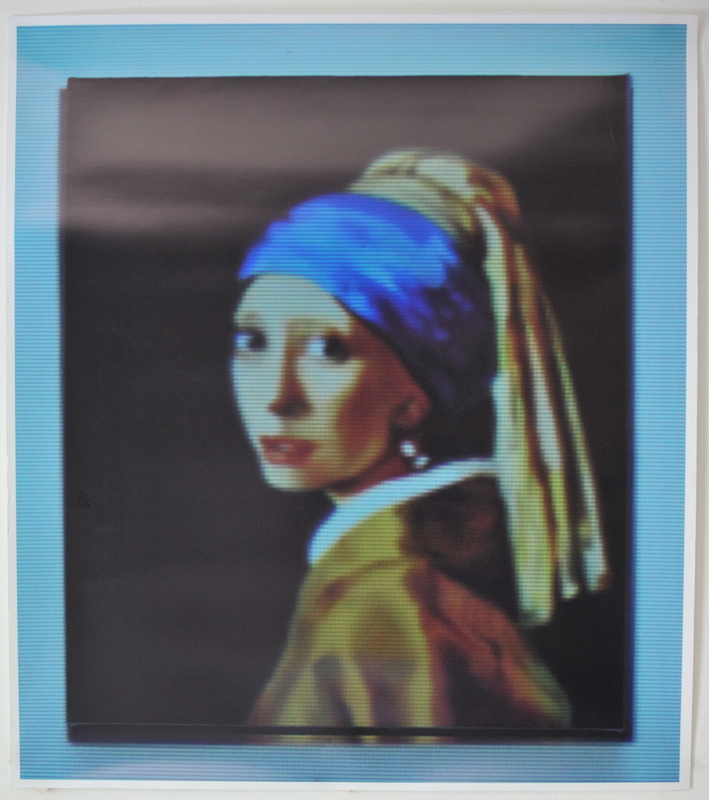 Second, because it was created using a camera obscura, one of the first paintings of its kind and a technique Vermeer was notorious for – making this work already slightly removed from the ‘pure’ act of painting from life. I recreated Vermeer’s painting by projecting an image of it onto a canvas and tracing it. I then took a picture of my painting and projected it again, onto a blank canvas (the same size as the original painting), and took a picture of the projected image on the canvas, and had it developed as a photograph. I projected the image on a blank canvas to draw connections back to the camera obscura, and also to utilize one of the common tools in assisting the creation paintings today.